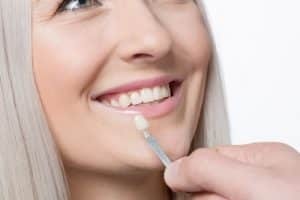 How Do Veneers Create Beautiful Smiles? If you have stained or misshapen teeth, then you may benefit from a restoration. We can often improve the appearance of your teeth with a dental restoration. How do veneers create beautiful smiles? What are they made from and who benefits from these thin and lifelike dental restorations? Question: What esthetic concerns can these restorations address? Answer: We can use them to address multiple issues. For example, we can mask permanent teeth stains and close gaps between the teeth. We can also place them to correct the appearance of minor alignment issues. They can also help reshape malformed or damaged teeth, or even lengthen worn down teeth. Question: How does the dentist place them? Answer: First, we need to prepare the teeth. To do so, we remove a thin layer of enamel. We then take detailed impressions, which are used at a dental lab to create the restorations. Once complete, the patient returns to the office and the dentist places them using a powerful bonding agent. Question: How do I keep them bright? Answer: To keep them bright you should maintain good oral hygiene. First, always take time to brush your teeth twice a day and floss every night before bed. You should also cut back on foods and drinks with dark pigments, such as soda, coffee, red wine, tea, and fruit juice. Finally, make sure your teeth are professionally cleaned every six months. Question: What are they made from? Answer: We use porcelain due to the material’s stain resistant nature and strength. In addition, the material mimics the lifelike appearance of natural tooth enamel. If you have any questions about our cosmetic treatments then please contact our office today.